Card deck contains a set of durable, laminated cards. 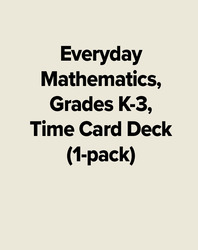 They can be used with the Everyday Mathematics card deck activity books or the Everyday Mathematics Games kit. Time cards represent 18 different times in 3 ways: in words, on a digital clock, and on an analog clock.